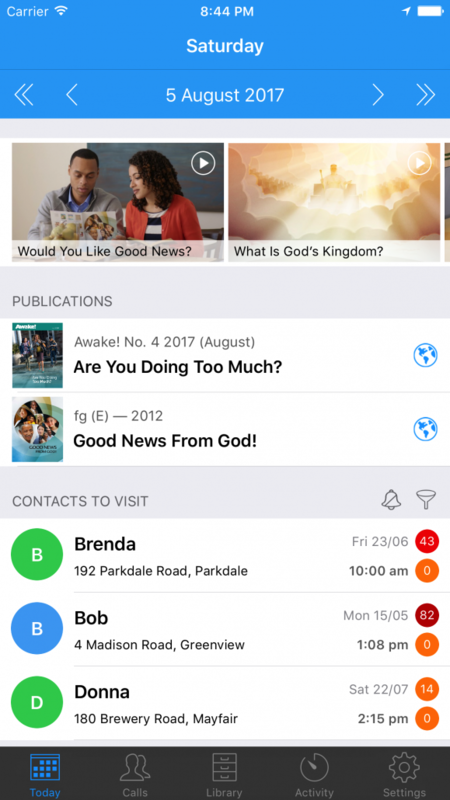 Field Service & Ministry app for JWs. Multi-device sync via Dropbox. 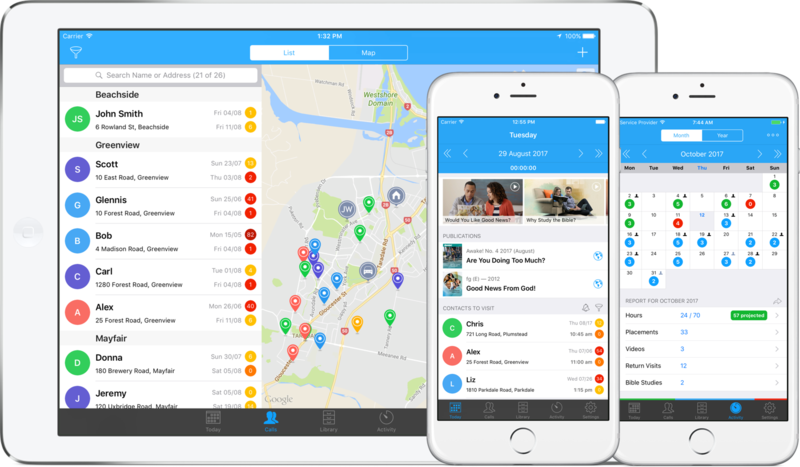 Scheduling, Reporting, Contacts, Return Visits, Map, Territory Management, Timer, Witnessing Partners and more. 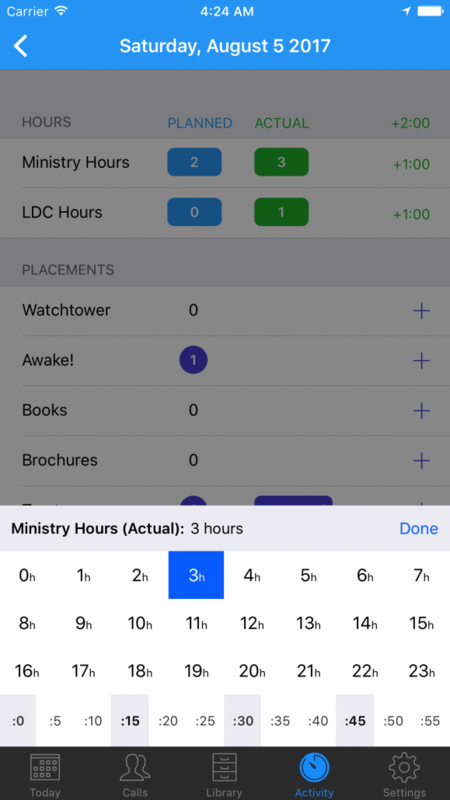 Ministry and LDC Hours supported. Optimised for your iPad and iPhone. Download now. Quick access to Videos, Publications, and Today’s Calls. 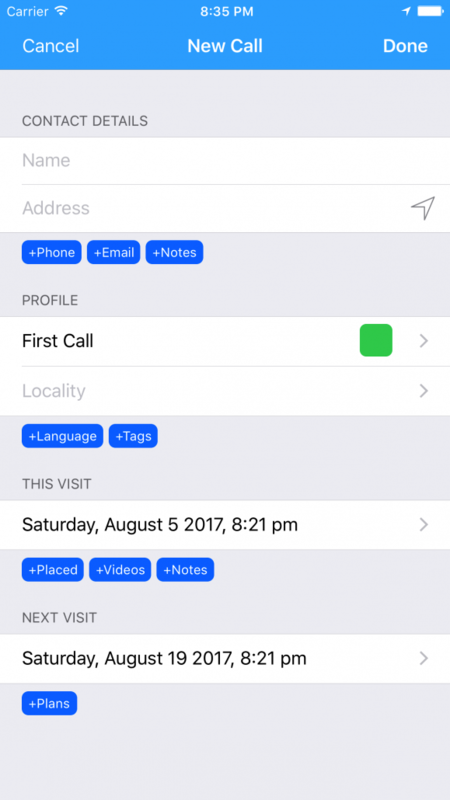 Optionally include overdue calls. The Filter button applies this list to the Calls tab and Map. Searchable Contacts List. Badges indicate the Contact Type. Indicators show days since Last Visit and until Next Visit. Swipe to delete or reschedule. Tap+Hold on any Contact to switch to Multi-Select mode. Bulk delete or update the Next Call Date. Map of Contacts by Type. 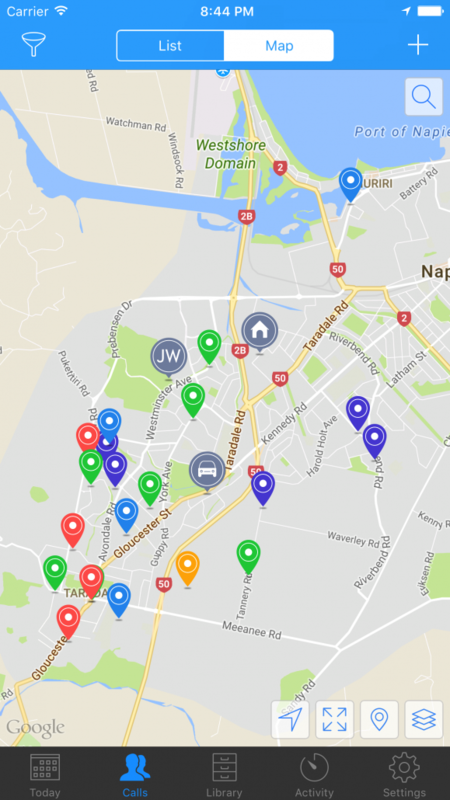 Add Markers such as Kingdom Hall, Home, Car Location and more. Quick zoom the Map to fit all markers. Tap+hold on a location to enter a new Contact. 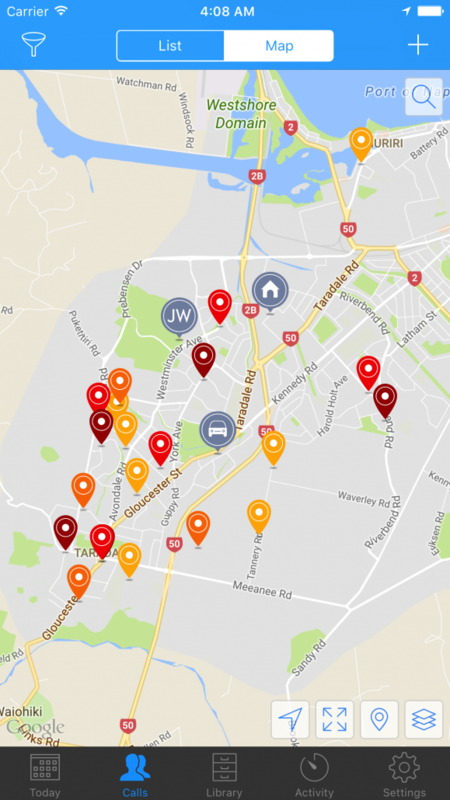 Change the Pin type to “Last Visit Date” to view a heat map. 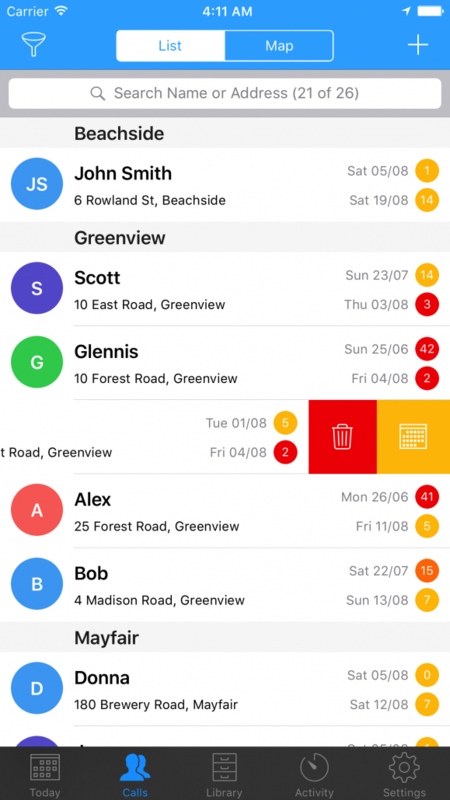 From “Yellow” which means “don’t worry” through to “Blood Red” which means you need to prioritise a visit on this overdue contact. Easily add a new Contact with geocoding, contact and profile data, tagging, next visit details. Minimum back and forth between multiple screens. Powerful Contact Filtering. Define sorting and grouping. Even Filter for contacts with publications Placed or Not Placed. 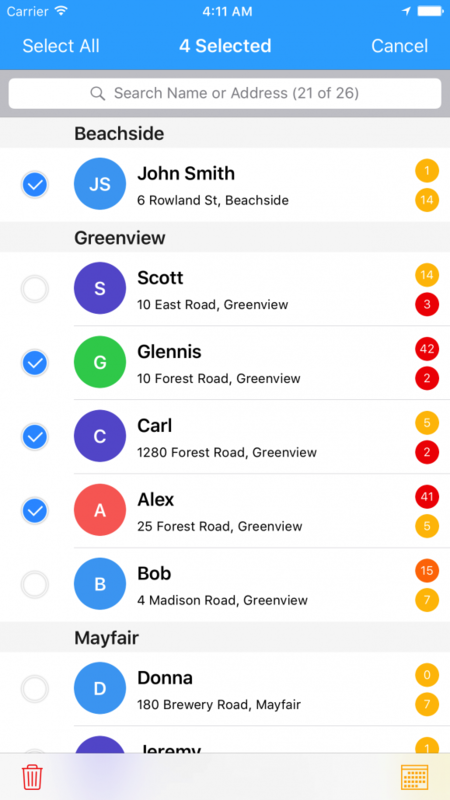 Quickly switch your view of Contacts using saved filters. You will soon be able to save your own Custom Filters to optimise your workflow. 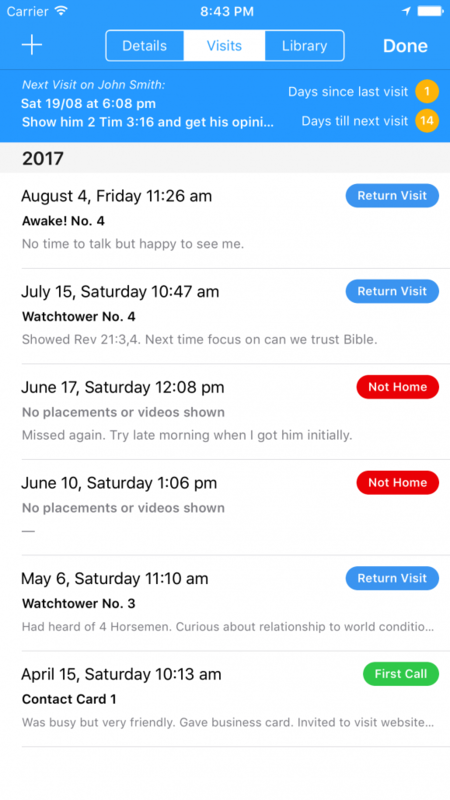 List of visits made on a contact with the Type of visit and Date clearly identified. Next Visit Date and Summary at the top. The calendar layout clearly shows your Planned vs Actual hours for the month as well as a live Report summary. Projected hours are clearly shown. From this screen click on a day to zoom in on your activity for the day. 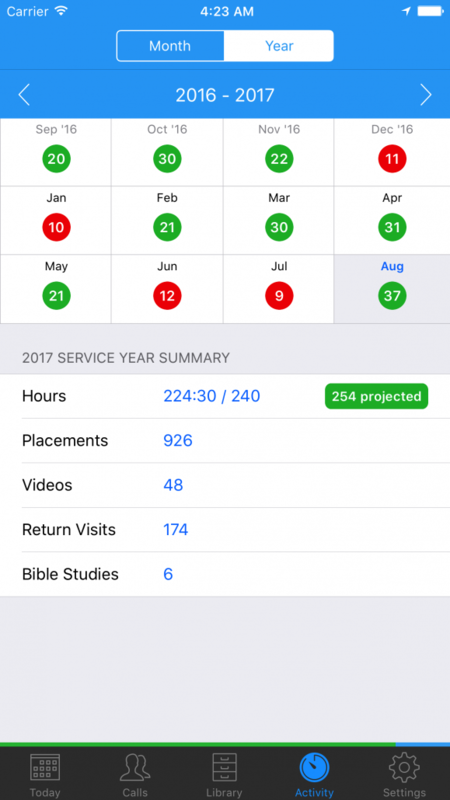 A summary of your Service Year activity clearly shows your Hours per month, whether you achieved your goals, and your projected hours for the Year based on your schedule. Set Planned Hours vs Actual Hours. Placements, Videos Shown and Visits made are based on updates to your Contacts. Click the “+” to manually enter Placements where you do not have Contact data. The custom built Hours Selector makes it easy to enter Hours and Minutes. If you want to enter a larger amount of hours tap+hold on some input boxes to view an alternate input mode. 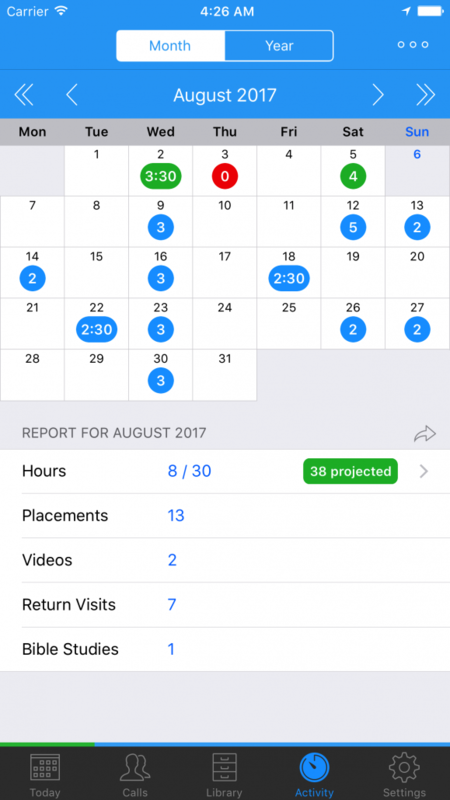 View a detailed breakdown of your Hours. Customise your Goals for this month. View Carried minutes from last month. See if you are on track to meet your goals. Enter in as many Hour Credits as you require. Perhaps you are attending the Pioneer Service School? You have full control over how Credit shows in your Activity and Report. Define your Annual, Monthly and Daily Goals. All publishers are encouraged to set Ministry Goals, not just Pioneers. You can “Apply Your Daily Schedule” to a Month from the Activity screen top/right menu. The Library is blank by default. Add Publications and Videos. View and search in both Grid or List mode. Select cover artwork from your Camera Roll, or from your Clipboard if you copy images from your browser or from JW Library. 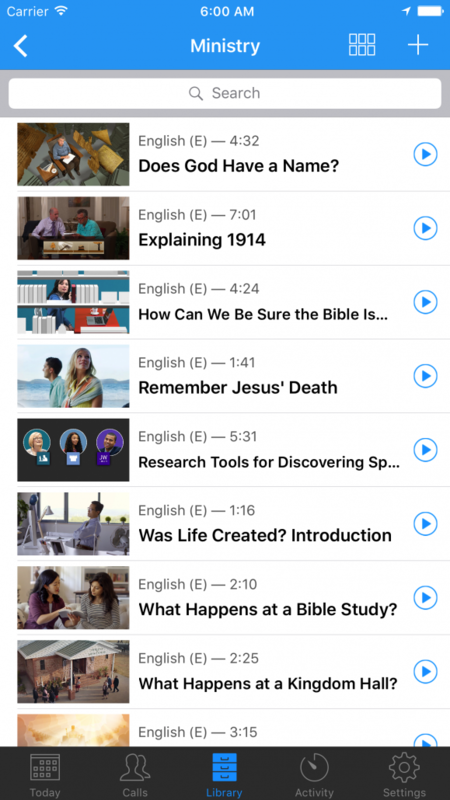 Videos can be optionally Downloaded for offline use, or Streamed if you would prefer to free up storage space on your device. Toggle between List View or Grid View. Use Dropbox to automatically backup your data or sync between multiple devices. You can optionally limit syncing to “Wifi only” if you want to minimise your mobile data usage. If you don’t have a Dropbox account you can create one for free at dropbox.com/register. You have control over what happens when a new Contact is created or a new Visit is added to a Contact. 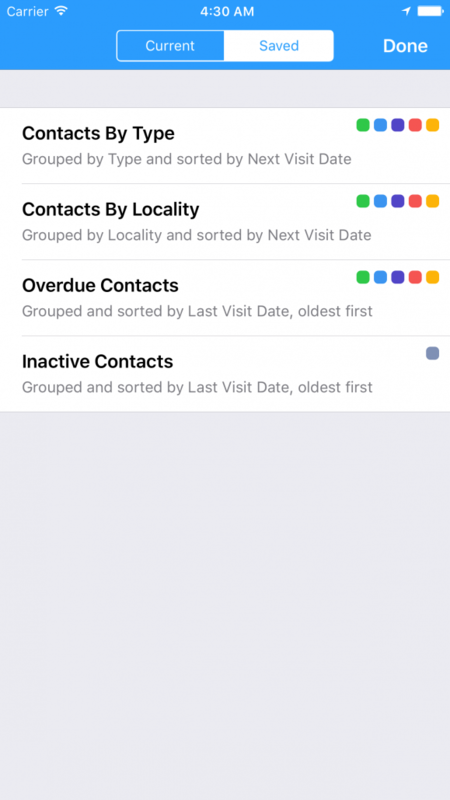 Based on the Contact Type, you can set the number of days auto-assigned to the Next Visit Date and what Visit Type is selected. Control when the Pins change from Yellow > Orange > Red > Blood Red for each Contact Type. The “Other” Hours category can be used for many things. Perhaps you do LDC work? Or you are a Branch Consultant? 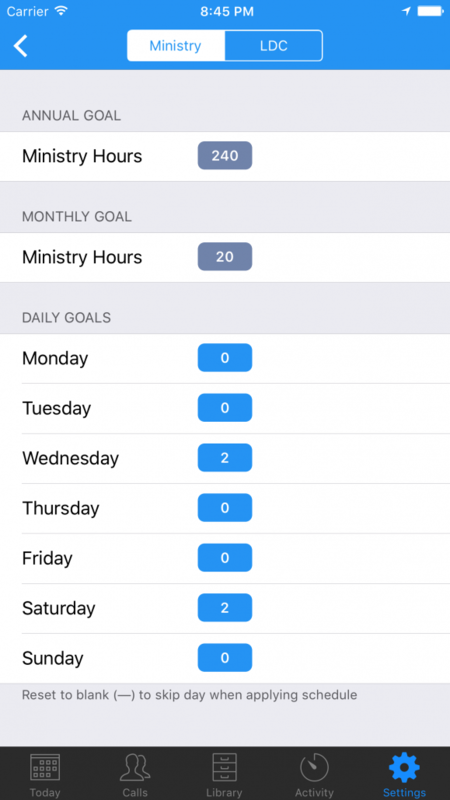 Plan and track your hours with this category. You can rename the category in Settings to match your requirements. 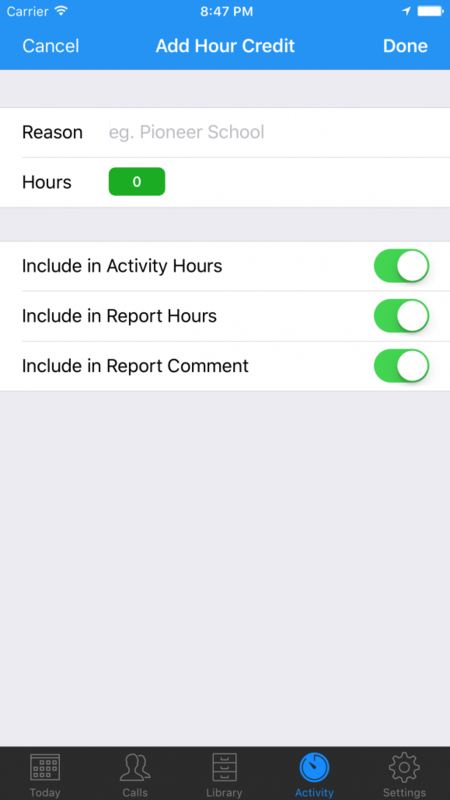 In the Settings you can control if these Hours are included in your Activity screens, in the Hours column of your Report, or just in the Report Comment. ServicePlanner includes a lot of powerful features. But this is just the beginning. There are so many more exciting features to come. 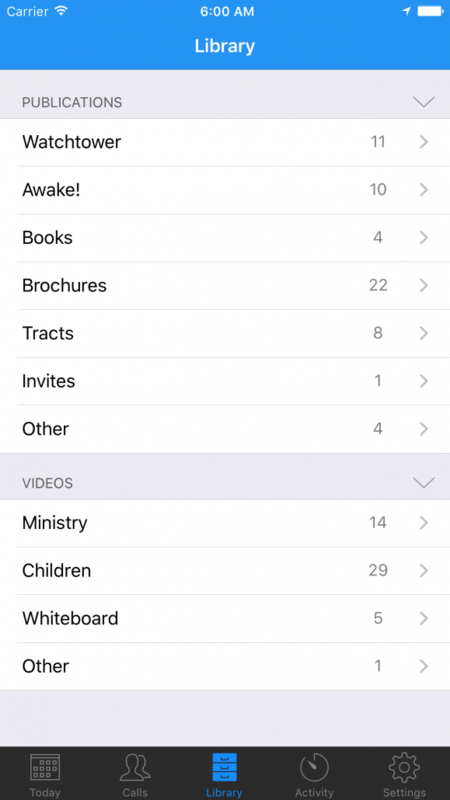 I hope this app helps you to have a fulfilling and productive ministry.